This PowerPoint slideshow is fully-animated. Just click and go. 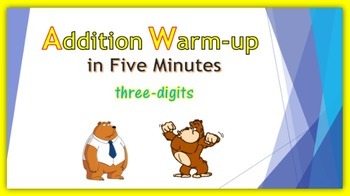 Five minutes long for a quick math warm-up for adding three-digit numbers. Students have six seconds to solve a problem, and then the answer pops up. Immediate feedback! 40 problems and their answers as students add doubles (125+125, 311+311), consecutive numbers (211+212, 320+321), hundreds (400+538, 600+269), and mixed practice (730+260, 463+482). 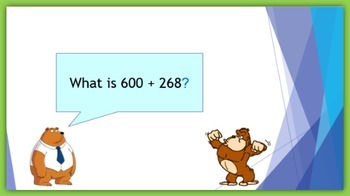 This slideshow is perfect for a warm-up before your whole-class math lesson. Or, use it at the end so that you can do “teacher stuff” while your students solve 40 problems. Or, you can place it on student-computers for independent review as a Math Center. Take a look at the Preview to see some of the slides in this slideshow.